Why Choosing Vertical Blinds For Your Home is a Great Idea? Vertical blinds (Also known as Vertical Venetian Blinds) have slats that hang vertically. The entire blind is operated by a chain/wand and a separate cord. You control the blinds by tilting the chain/wand and turn the slats while the cord control opens and closes the blind. They truly are efficient to use. Blinds give a sleek, neat, up-to-date look to a home and they are incredibly versatile. There are many different reasons for choosing different types of blinds. It really depends on the interior design of your home and also what type of windows you have. Vertical blinds can give the illusion that your room has a greater height. Vertical blinds are an old time favourite and they’re really coming back into style. They are an excellent option for your windows and doors. They can be tilted or pulled back completely. This means that you can adjust them to suit the time of day or season. Easy to keep clean as vertical blinds don’t gather dust as quickly as horizontal blinds do. Cooler room as you can adjust the amount of sun rays beaming into your home. They also keep your home warm in winter by preventing cool drafts. You still have a view, they effectively regulate light. 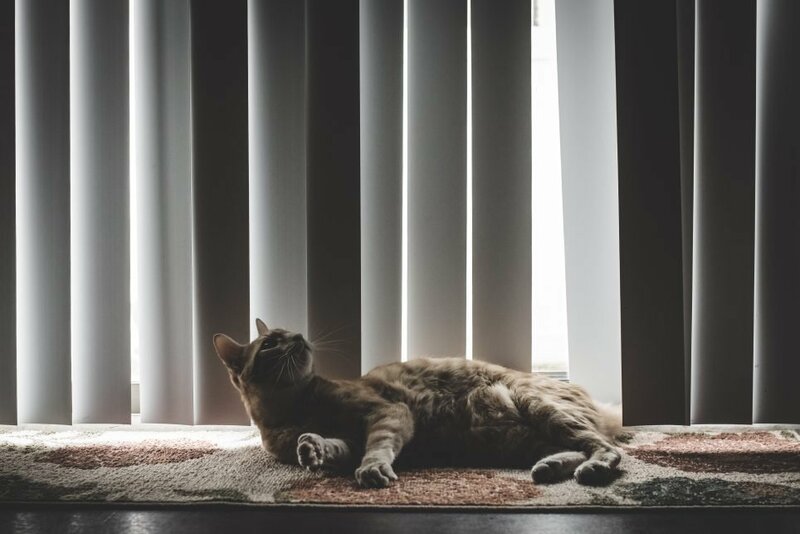 Vertical blinds help maintain the room temperature as they prevent heat from escaping in colder months and block the sunlight out during hotter temperatures. They are also great as you can still have privacy and keep windows and doors open to regulate fresh air with the blinds closed. This is a wonderful way for keeping insects outside. What Type of Windows are Vertical Blinds Best For? There is no limit to how wide vertical blinds can be made. They are ideal for large windows and patio doors. Vertical blinds fit a wide range of dimensions, not all blinds can fit these dimensions. Vertical blinds are also perfect for curved and square bay windows. Vertical Blinds can fit almost any window style as they can be customised. One of the best parts of having a home/workspace is getting to decorate and make design choices for your living space. Whatever your tastes are, whatever your style preferences are, there are endless colour, fabric and flooring choices. Vertical Blinds can be drawn neatly back to the side to offer unlimited views. The louvers can be rotated through 180 degrees to allow just the right amount of light into the room and maintain an element of privacy. Vertical Venetian Blinds are extremely cost effective. When used to cover a sliding patio door, the blinds can quickly and easily be fully or partially opened to allow you to walk in and out with no awkwardness. It is so simple to repair them. Like all things, they can wear out or become broken. Whether it is wear and tear or an accident, you can replace individual louvres instead of replacing the whole thing. This will save you money and hassle in the long run. Vertical blinds are very practical in your home and are great for privacy too. They can also add a stylish touch to your home. There are so many gorgeous colours, textures and patterns to choose from, to suit every interior style. They are also extremely affordable considering all the pros that come with it.